Premises liability refers to the liability of a property owner for accidents that occur on their property. Property owners in Virginia must make sure that their premises are safe for visitors, although the duty of care owed varies depending on how a visitor is classified. Virginia recognizes three groups of visitors. Invitees are people on property through the expressed or implied invitation of the property owner and are owed the highest duty of care, licensees are individuals who are on property with permission but usually for their own benefit and a property owner must warn the licensee about any potential hazards, and trespassers are people who are on property without permission and are owed no duty of care. A premises liability claim usually involves a person suffering injuries in an accident caused by some kind of dangerous property condition. Many property owners and their insurance companies will immediately blame the victims for their own injuries. If you suffered severe injuries or your loved one was killed in an accident caused by a dangerous condition on another party’s property in Virginia, do not wait to retain legal counsel. It will be incredibly important for you to get a skilled Virginia premises liability attorney involved as soon as possible. CHASENBOSCOLO has been helping injury victims all over Virginia since 1986. Call (703) 538-1138 or contact us online to schedule a free consultation. Do I Need A Premises Liability Lawyer? You might be tempted to think that you can keep more money for yourself by handling your own claim filed against the negligent party for your premises liability accident, but people usually learn pretty quickly that insurance companies do not provide payments in these cases very easily. When you file your claim, the insurer will assign the case to a claims adjuster who then conducts their own investigation. You could experience numerous delays while the claim is being investigated. At some point, the claims adjuster will likely contact you and ask you to provide a recorded statement. It is critical that you not speak to any representative for an insurance company. The goal of every one of these conversations is simply to get you to unknowingly admit to some degree of negligence in your accident and thus accept enough blame to prohibit you from being able to file a lawsuit possibly. An attorney can immediately step in and handle all phone calls from insurance companies on your behalf. Some insurers may offer you a lump sum settlement to resolve your case, but the offer is much less than what the lawyer will be able to recover. Taking care of the client has always been and will always be the first and foremost priority of CHASENBOSCOLO. We will take the time to get to know you and have you tell us all about every way your injuries have affected your life so we can present a compelling case to a jury. 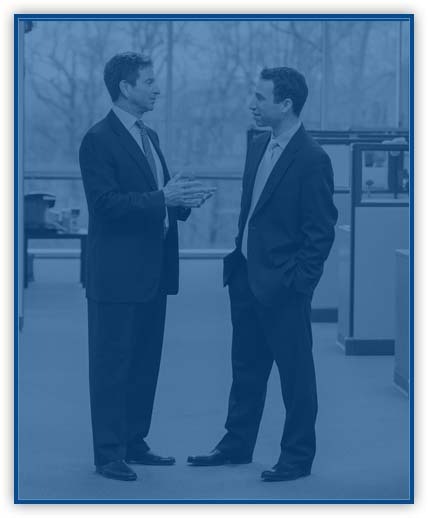 Our firm now includes 25 attorneys and over 90 professionals who have more than 100 years of combined legal experience. They are available 24 hours a day, seven days a week, so you can know that we can always be reached whenever you need to contact us. Barry M. Chasen and Benjamin T. Boscolo have both received an AV Preeminent rating from Martindale-Hubbell, denoting the highest level of professional excellence. Mr. Chasen was named to the National Trial Lawyers Top 100 Trial Lawyers in 2013, and Mr. Boscolo received the Dean’s Award for Professional Responsibility from American University in 1986. Our firm also offers the No Fee Guarantee® so you will not have to worry about paying us unless you get a monetary award. CHASENBOSCOLO is committed to helping you achieve a fair and full settlement, but we can also file a lawsuit if necessary to recover proper compensation. Hotel Injuries — Hotels, spas, and resorts are common sites of premises liability claims. Hotels have an obligation to make sure that their properties are safe for their guests, and this includes not only maintaining the actual premises but also having the necessary security. Hotels also have a number of features that can be involved in premises liability claims, such as swimming pools. Inadequate Security — Several businesses need to invest in proper security for the safety of their employees, customers, or other guests. When security is lacking, it can lead to people being the victims of various crimes, including theft or violent crimes like assault or sexual assault. The property owner may be liable for a victim’s injuries when the security failed to prevent certain incidents. Slip and Fall Accidents — A slip and fall accident is typically one of the most common kinds of premises liability claims. Such incidents usually occur because of a property owner’s failure to correct a hazardous condition such as a spill on a floor. Retail establishments are common scenes of slip and fall accidents. Other common kinds of premises liability claims may include porch collapses, stair collapses, swimming pool accidents, fires, elevator and escalator accidents, falls from heights, dog bites, electrocutions, and exposure to toxic chemicals. What should I do if I am involved in a premises liability accident? The first thing to do after an accident on another party’s property is to make sure that you receive medical attention. Even if you do not think that you were harmed, you will still want to go to a hospital just as a precaution. It is also important to try and take pictures of whatever caused your accident. Do this before the property owner has an opportunity to correct the issue, and the evidence disappears. If any people saw your accident, ask them for their names and phone numbers. When you cannot take these measures, ask a friend, family member, or neighbor to do this for you. If your accident occurred at a place of business, file a report with the manager or other supervisors on duty. Ask for a copy of the report. Make sure that you call a lawyer before you answer any phone calls from insurance companies. What legal recourse do I have if my premises liability claim involves my workplace? If your accident occurred because of a hazardous condition on the job, then workers’ compensation will likely be your only avenue for recovery. You can only file a lawsuit against your employer if they did not have workers’ compensation insurance. If your accident involved the negligence of a third party, however, you could be able to file a lawsuit against the negligent third party at the same time you are receiving workers’ compensation. Can I sue a governmental agency? Yes, but there is often a more stringent statute of limitations applicable in these types of cases. With most governmental agencies, a plaintiff will be required to file a Notice of Claim, also known as a standard form 95 or SF95. Virginia Code § 15.2-209 provides that a written statement of the nature of a claim against any county, city, or town for negligence must be filed within six months. When a claim is filed against the state (or the Commonwealth), a written statement must be filed within one year. Any tort claim filed against a governmental agency will be done in accordance with the Virginia Tort Claims Act, which limits a plaintiff’s damages to $100,000. What must be proven in a premises liability case? A premises liability action will require a plaintiff to prove the same four elements central to any negligence claim. First, the defendant must have had a duty of care to the visitor to keep their property safe or warn the visitor of any dangers. The plaintiff will need to prove that the defendant breached that duty by not keeping the property safe or warning the visitor about a dangerous condition. The victim then needs to prove that this breach of duty caused the victim’s injuries, and those injuries resulted in damages. Maryland employers who staff at least one worker are required by law to carry insurance on employees that covers workplace injuries. State law also requires sufficient notice to be given to employees that coverage has been obtained by the employer. These notices are prominent in break rooms or on the door of HR offices. What kinds of damages can be recovered in a premises liability lawsuit? The damages awarded by juries are called compensatory damages, and they are usually a combination of economic damages and noneconomic damages. Economic damages are actual losses that can be calculated and proven like medical expenses, lost income, and property damage. Noneconomic damages are not quantifiable and may include emotional distress, loss of consortium, or pain and suffering. Punitive damages could also be awarded in cases involving particularly egregious misconduct by a defendant, but punitive damages are rare, and Virginia Code § 8.01-38.1 limits punitive damages to $350,000. Did you sustain catastrophic injuries or was your loved one killed in an accident caused by a property owner’s failure to correct or warn you about a dangerous condition in Virginia? Know that you do not have to struggle to recover compensation on your own. An experienced Virginia personal injury attorney like those at CHASENBOSCOLO will stand up for you. CHASENBOSCOLO can fight to make sure you get every last penny of compensation that you are entitled to. Let our lawyers discuss all of your legal options as soon as you call (703) 538-1138 or contact us online to set up a free consultation.